How big of a deal is the UAW vote in Tennessee? Grover Norquist has shown up and funded a bunch of-anti union organizations to scare the good people of Chattanooga into telling their friends who work at the plant they shouldn't vote to allow a UAW-backed deal to appoint a "works council" next week. One of the billboards, pictured above, calls them the "UNITED OBAMA WORKERS" and says "The UAW spends millions to elect liberal politicans, including BARACK OBAMA." I guess better a politican than a politican't. All jokes about spelling errors aside (I'm the last who should judge), this merely underscores the importance of this vote. If it gets through, all foreign-owned car companies south of the Mason Dixon that have avoided unionization are at risk. Bob King, outgoing UAW president, will have been the man who saved the American union and helped German union IG Metall in their plans to globalize unions the way that car companies have globalized production. Tennessee Senator Bob Corker will risk a primary challenge as the man who helped bring Detroit to Tennessee. If they lose, the cause will be set back a generation, Bob King will be remembered as having a mixed legacy, and Corker will celebrate dodging a bullet. But what happens to Tennessee? 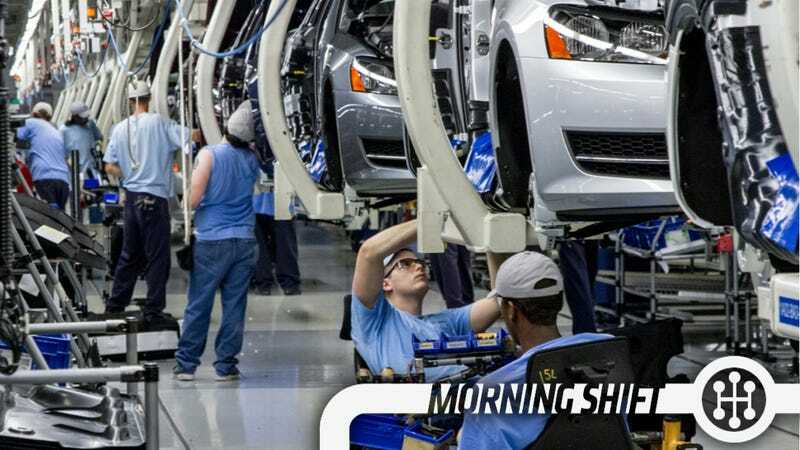 The VW plant there is already churning out a ton of Passats, but it's possible that this move will pave the way for the company to build their new seven-passenger SUV there. OR maybe such a move will cause them to send it to Mexico. Volkswagen has mostly stayed out of it, leaving it to the workers to vote. Either way, this is a bigass deal. What is a Chrysler? Is it a Dodge with a lot of chrome? Is it premium? Near-premium? "The reality is Chrysler brand needs to be relevant and relevant is not necessarily playing in midsize, large car and minivan (only)," Gardner said on the sidelines of the Chicago auto show referring to the three products. "Are there opportunities outside of that? There are always opportunities. (Future product) has to sit on the showroom floor and it cannot compete with Dodge, Jeep and Ram." So what the hell does that leave? Maybe a station wagon. 3rd Gear: Ford Not On Board With The D.R.E.A.M. Yet again, Ford's pissed off that any upcoming deal with Asia (in the form of the Trans-Pacific Partnership) isn't going to address currency manipulation by Shinzo Abe. oe Hinrichs, Ford's president of the Americas, said in a speech to the Economic Club of Chicago, the proposed Trans-Pacific Partnership must address currency manipulation. "The real elephant in the room right now is currency manipulation, and we need to make sure that it is not ignored. It represents the major trade barrier of the 21st century — and it must be addressed in any future U.S. trade agreements," Hinrichs said. "Countries like Japan have historically manipulated their currencies in order to gain unfair advantages in the global marketplace and protect their home markets." I like the Japanese response, which is that Japanese people just don't like American cars — and yet import old Econoline vans as soon as they've got a few yen in their pockets. The cars may not have been a hit, but Fisker stills holds on to more than a dozen sweet sweet patents that Chinese companies want a part of, reports Bloomberg. Right now the company is in between China's Wanxiang Group — owner of Fisker battery supplier A123 Systems — and super rich guy's Hybrid Tech Holdings. The company wants to go to Wanxiang, but some of the people left holding the bag when Fisker went under want the money that Hybrid Tech promised them. February 12th is going to be interesting. As chair of the Senate Commerce Committee, West Virginia Democrat Jay Rockefeller has a powerful voice when it comes to industry. And right now his voice is asking: "Why is it so important for kids to drive around and update their Facebook statuses?" Why indeed, although he answered his own question by pointing out "it's a way of being cool" and "a way of you being cool and making a lot of money from that." Neutral: UAW Showdown? What do you think's going to happen?